For the final installment of the Fall 2013 Student Lecture Series, landscape architect Ken Smith presented Larger Landscapes. He discussed several projects that were quite diverse in terms of program and scale, yet quite similar in their focus on balancing landscape architecture, art, and urban design. This delicate balance is what makes his spaces so successful; they are thoughtful in terms of occupation and aesthetics as well as respectful of their context and urban environment. 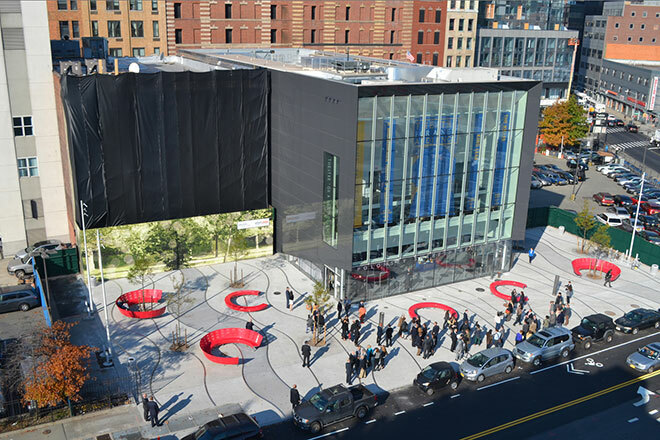 The streetscape and plaza that Smith designed for the BAM Cultural District in Brooklyn combines these design elements in an urban hardscape. He developed street furniture that would feel appropriate for a theater, using red to remind visitors of a theater curtain, and implementing a playful form that hints at a convivial and social atmosphere. He addressed the urban condition by using pervious concrete, which simultaneously blends the plaza with its surroundings and allows for improved stormwater runoff and trees within the hardscape. 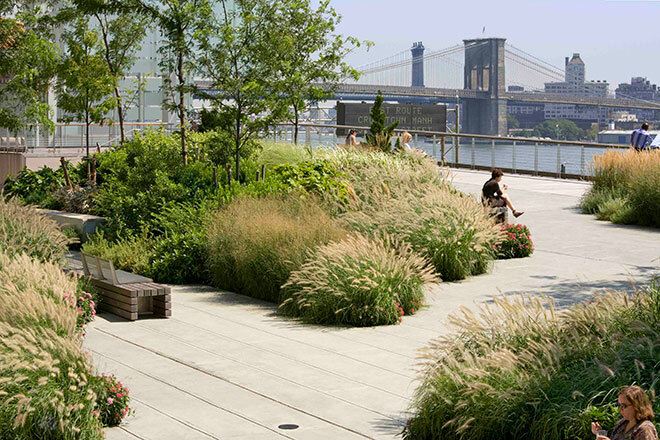 Resolutions such as these create a space that respects its context while making it a place that people want to occupy. Smith also presented a small scale project that he did for a residence in Long Beach, California. His elderly clients had a terraced slope that was beginning to be difficult to traverse, so Smith was commissioned to design a landscape that would resolve the problem. The result was a continuous railing, which was artful in nature, surrounded by a new planting scheme that created an enjoyable landscape space. 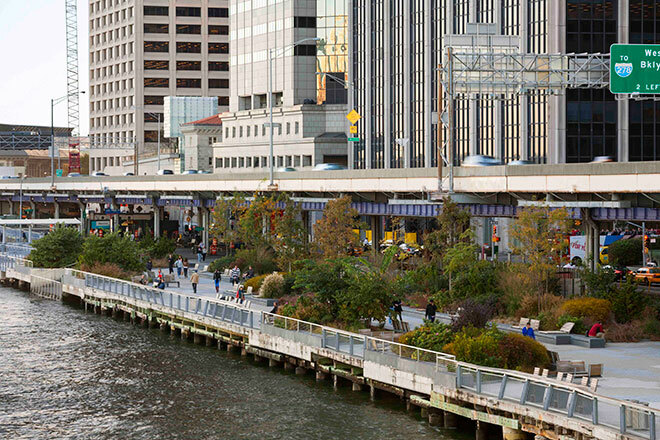 On the opposite end of the scale spectrum, Smith discussed a long term project that is still underway: the East River Waterfront Esplanade in New York, a major part of the city’s effort to reclaim waterfront areas for accessible public space. The two mile stretch that Smith is designing includes a diverse range of urban context, including neighborhoods such as the financial district, a public housing area, and Chinatown. One of the most difficult challenges was the site itself; because of the waterfront highway, the site goes back and forth between being under the road without natural light and being built out over the water with no soil. To resolve this, Smith built a set of dunes that both provide soil and create an obstacle course of sorts, one that allowed him to frame views across the river and force visitors to meander through the space rather than rushing through it. The street furniture was another focal point of the design. He designed a set of pieces including chaise lounges for individual people to relax in, facing benches for multiple people to sit and talk comfortably, and bar stools on the water with a railing in front of them that is wide enough to either set down a laptop or put up one’s feet. The attention given to how people occupy spaces and what will make visitors comfortable are what make Ken Smith’s projects successful. The importance that he places on this was clear in his presentation, and it was evident that this is a major driver of his design process. His implementation of this across widely varying scales reveals that this approach to landscape is also valuable in other fields, such as architectural, interior, and urban design.